The paradigms of big business have changed. Business models that were once lucrative now seem to barely move the needle. Incumbents of the old guard find themselves superseded by new, digitally-charged, data-fuelled organisations that leverage platform-based business models. How can pre-digital businesses survive? They’re loaded with resources, brand power and deeply embedded networks, they just need a new playbook. Chasing Digital is that playbook. Outlining a clear and detailed framework, this book is designed to help leaders re-design their organisation from the bottom up by leveraging their strengths to create a new competitive advantage in the digital economy. From laying the foundations of transformation: developing a considered strategy, growing a conducive culture and building a receptive organisational design; to building core digital capabilities: taking advantage of data, harnessing artificial intelligence and embracing appropriate platforms; to adapting the accelerators of change: navigating board expectations, mitigating potential roadblocks and making the right investments, this playbook will give you the tools and mindsets needed to not only survive but to thrive and leave a legacy for future leaders. Cut through the jargon and hype, and focus on what is critical to undertaking a truly successful, company-wide, digital transformation. 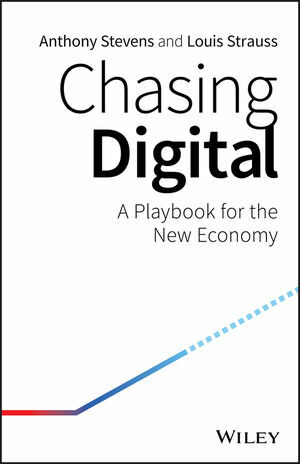 In a world where digital is changing everything, Chasing Digital will help your organisation to transition beyond old business models to adopt the new digital paradigm and a new era of business. Embrace the chase. ANTHONY STEVENS is a global thought leader in technology and digital transformation, a co-founder of two startups and a former Partner and Chief Digital Officer at one of the largest professional services firms and brands in the world, KPMG. LOUIS STRAUSS is a consultant focusing on digital strategy and transformation who embodies the very qualities that the target market for this book is struggling to manage.